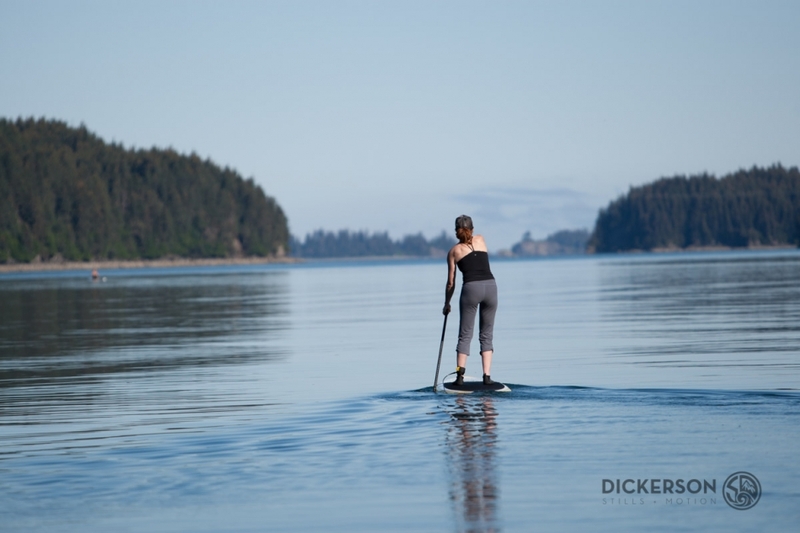 A lot of people contact us interested in stand up paddling here in Alaska but don’t know where to start. We’ve introduced hundreds of people to the sport of SUP and we’ll be happy to do the same for you. We take pride in offering personalized service and good solid advice based on our years of experience paddling here in Alaska. Take a minute to read through the information below and feel free to contact us if you have anymore questions or are ready for some personal advice, whether you are ready to buy or not. 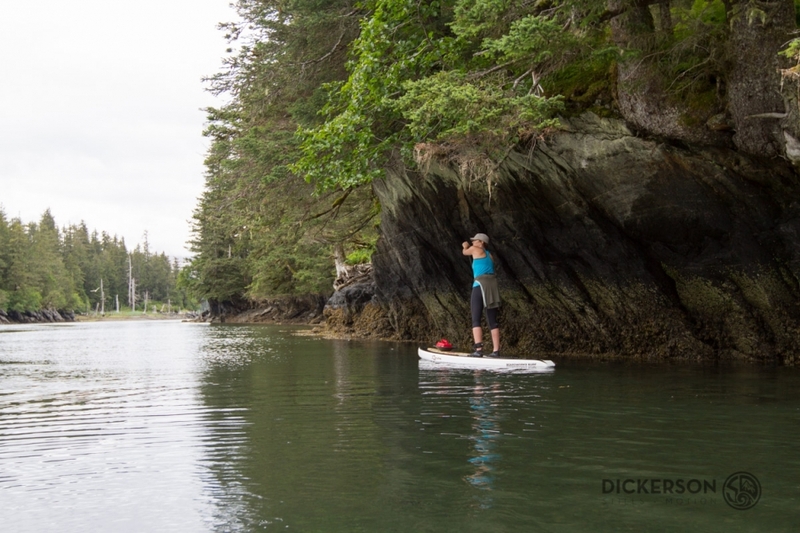 Ocean, rivers, lakes, tidal sloughs, harbors, surfing ocean waves and bore tide waves…opportunities to Stand Up Paddle abound in Alaska if you know where to look. 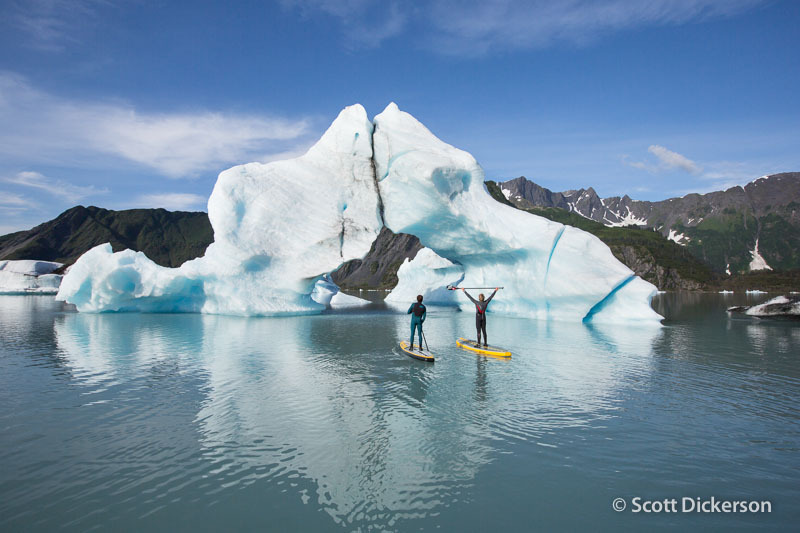 Our customers paddle in the Anchorage area and interior lakes, rivers, Turnagain Arm, Cook Inlet, Kachemak Bay, Prince William Sound, Southeast Alaska- anywhere there is water. Some people just want to dabble in the water at their lake cabin, others are looking for an adrenaline rush surfing the bore tide in Turnagain Arm. When you are thinking about your paddling future it’s helpful to identify what type of paddling you are wanting to do. Stand up paddling can be generally separated into four main types – Touring or flatwater, surfing, river riding, and just goofing around. There are boards designed for more specialty uses such as racing, fishing, and river wave surfing as well. Touring – Also called flatwater – think cruising, exploring, exercise. You might be paddling around the harbor at sunset, going over to visit the neighbors near your lake cabin, exploring a new cove you just anchored the boat in. 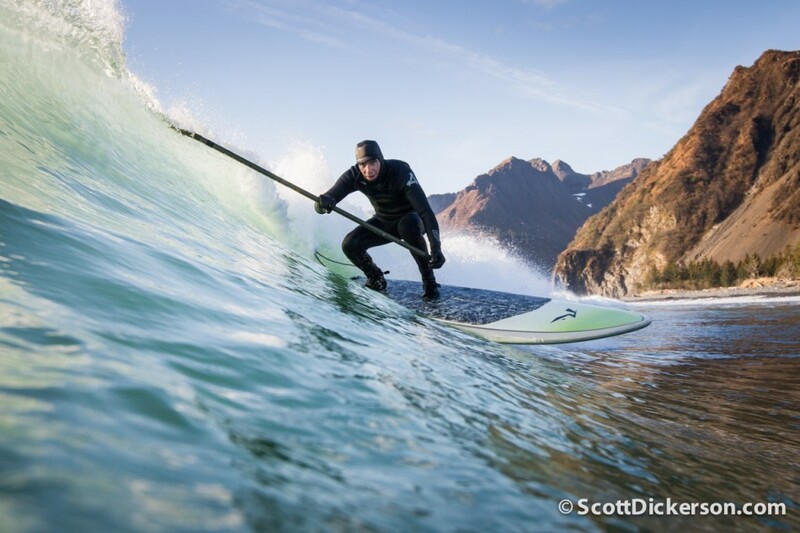 Surfing – This is riding waves in the ocean, a favorite past time of us here at Surf Alaska! River riding – Paddling down a river (up if you are crazy). We used to do this on rafts or in kayaks before we discovered stand up paddling! Now we have our rafter friends carry our gear and we have an absolute blast playing in the river currents, eddies and surfing waves with our stand up boards. Just goofing around – You are thinking about trying some yoga on your paddle board, splashing around by the dock with your dog and kids on the board with you. Maybe you want to cast a fishing lure on the lake or just sunbathe on the board. Specialized – Is your paddle board just a tool to help you catch fish? Are you interested in doing extended expeditions on your board? SUP Yoga? Surfing river waves? There’s a board design for all these special uses. 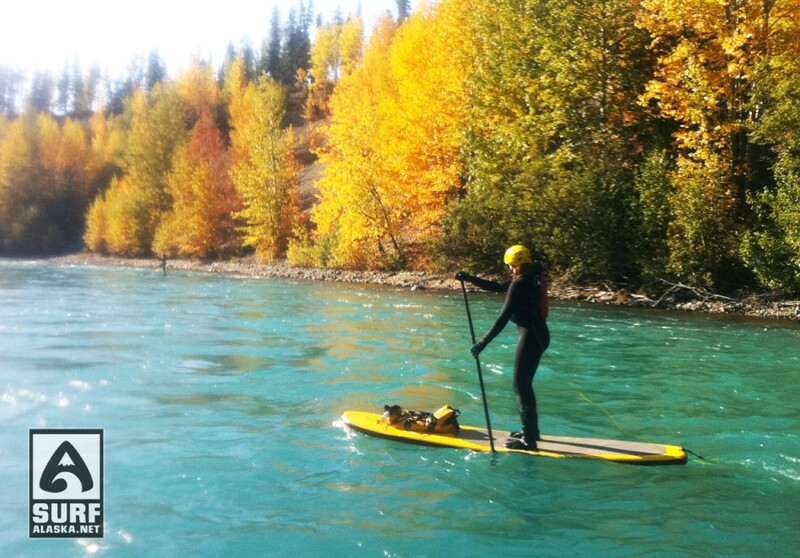 For every type of paddling (see above) there are boards designed just for the purpose. The more specialized boards don’t necessarily cross over into other paddling types very well so it’s important to consider your potential interests in advance. The way I explain it for most people is that performance surf designs are on one extreme of the spectrum and racing boards on the other. Most boards fall somewhere in the middle with a balance of compromises. For example if you are going to use your board for touring 90% of the time, but you might try and catch a wave if you get the opportunity it would be prudent to get a board that will make touring enjoyable and yet be capable of surfing. If you will be surfing mostly but might also just go for a paddle on a calm evening it would be good to have a board that is mostly surf specific design, but still stable and large enough to make flatwater paddling enjoyable. In addition shape or design the construction of the board is a consideration. Construction type influences weight, durability and expense of a board. Depending on your lifestyle a lighter, more fragile board might be fine – or it might make sense to choose an option that can withstand more abuse. 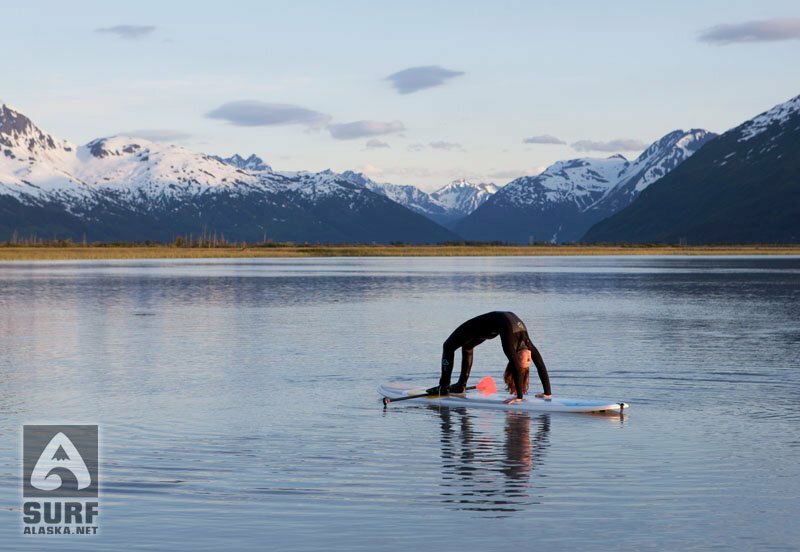 Surf Alaska sells all types of paddleboards including collapsable inflatable boards, traditional fiberglass construction and some new technology using fiberglass and plastic resin for incredible durability. They are incredibly tough and can handle the kind of abuse often reserved for river rafts. They are difficult to surf compared to rigid boards – if you plan to surf I would think twice about going inflatable. Many people don’t think about inflatable boards as an option, but I can say from years of experience they are incredible and can go with you places where you would never take a rigid board. You don’t have to be careful with them because they are so tough and when you are done they can be rolled up in a bag. There are nice designs for touring, fishing, and general purpose goofing around. For surfing or active paddling we mostly prefer the thinnest wetsuit that will keep us adequately warm. For touring we often wear sleeveless wetsuits or occasionally risk a cold swim and wear street clothes. The water isn’t warm in Alaska and the weather changes quickly so we always consider our safety when deciding what to wear but mostly new stand up paddlers in Alaska are amazed at how warm and comfortable they can be with even a minimal investment in the appropriate wetsuit and booties for their style of paddling.